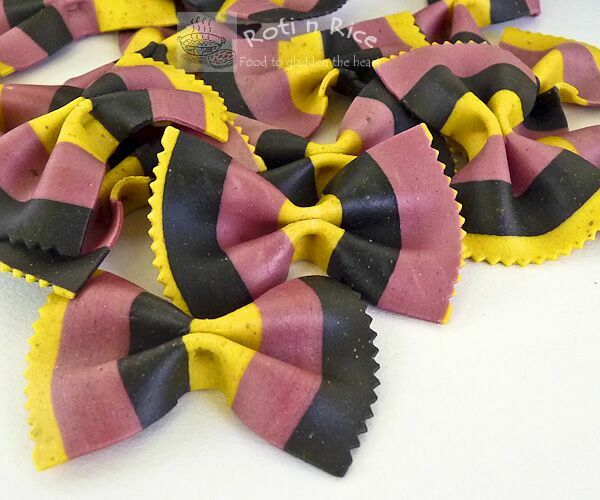 I have always liked farfalle or bowtie pasta as they look so pretty. I like to use them in salads as seen in my Rainbow-tie Salad. Recently, I came across these very colorful bowties. I had to do a double take as I could not believe my eyes. These bowties are so pretty and colorful. One would assume that such colors could only be possible with artificial food coloring but on reading the label, I was delighted to discover that it was all natural. The yellow color is achieved using turmeric, the black from squid ink, and the magenta from beets. These bowties are made in Italy. I had to get a bag as I was curious about the taste and what it would look like after being cooked. I wanted to make a sauce that will enhance the ingredients used to color the pasta. Of the three colors, I figured that the color of the beet will probably not hold as fast as the other two. As such, I felt that a spicy calamari sauce would complement the turmeric and squid ink in the pasta. Okra which goes well with peppers and calamari, will provide the much needed green color for the dish. Lemon juice will give added zing. When cooked, the beet colored portion of pasta did fade to a rosy pink color. The pasta has a mild turmeric flavor and just a very slight hint of squid when boiled. The calamari and okra provided texture and the spicy and tangy sauce made this Okra and Calamari Farfalle very appetizing. Wow…that must be the most beautiful pasta I have seen! Lovely dish. The bowties are so pretty and this is definitely a colorful and tasty dish. Those look like Mad Hatter bowties! Everything looks fantastic together! Those bow-ties are beautiful. Great photos. This dish sounds really interesting and tasty! Thanks for sendng it along. ROFL I have to agree a little with Rick – this does look like something from out of Wonderland! But it is so beautiful, especially on that gorgeous, almost organic looking blue platter. I would definitely want to try this!! Wow, those bowties are way cool! Where did you get them? 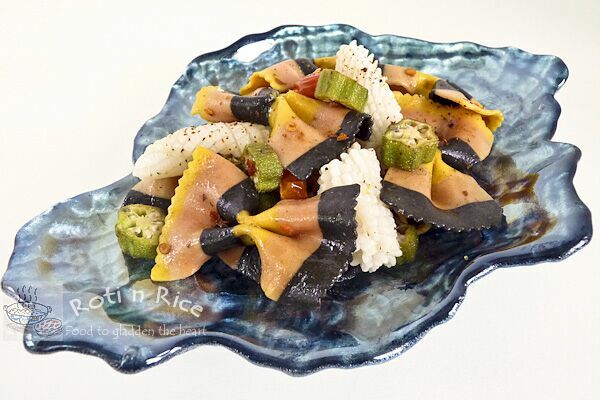 I love this pasta dish, thank you so much for a terrific 5 Star Makeover entry! @Rick – LOL! It is kinda Mad Hattish with all those colors! 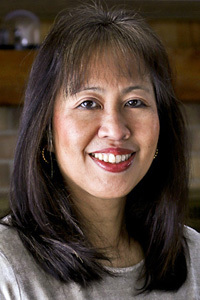 denise@quickies on the dinner table – ROFL too! When I first saw it, I just stood there and stared. There are other colorful ones but I thought this was the most stunning! I should have kept one bowtie for posterity…hehe. I hope the store will restock them. @5 Star Foodie – Yes, it is cool. It's produced by Pasta L'antica Madia in Italy. 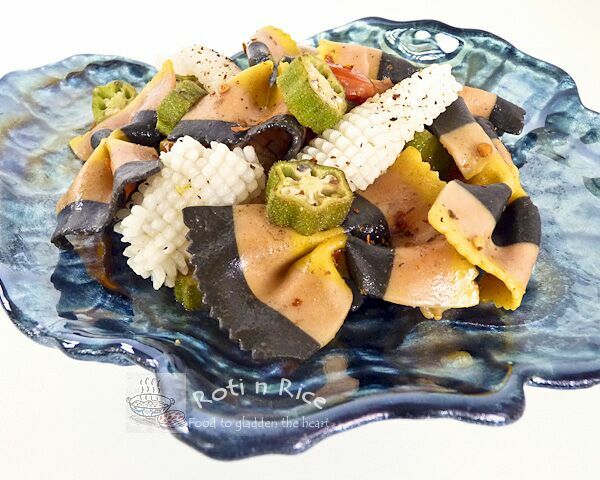 They have the most amazing pasta – all shapes and colors using natural food dyes. I found them at Homegoods and so am not sure if they'll be able to restock. They went fast! Biren what a beautiful serving plate you have there, what is it made of? I also love the colored farfalle, my mother in law gave me a bag once and I was excited about all of the colors :)Wonderful pasta dish! So beautiful! The pasta looks like festive decorations. Did the color change the texture or flavoring at all of the pasta? Very nice presentation. Yummy and healthy pasta. I love your bow tie pasta. Such amazing color palette. Thanks for sharing. Thank you for stopping by the blog. Wonderful dish. Inspired use of okra and calamari together. Cheers! Hey Biren, this pasta is awesome. Why do I never see stuff like this. I knew they were natural too-I could tell right away about the beet and turmeric. I can't believe the black is squid ink-very cool. Your dish sounds so delicious and healthful too! This is such a colorful dish! I love the bow-ties – have never seen anything like them. This looks very delicious too – you chose great flavors to go with them! @Joy – The plate is made of glass and I think it is made in Turkey. @Cristina – The pasta has a a mild tumeric flavor. When I was boiling it, there was a faint hint of the squid but not distinct after being cooked. @Mary – Yes, the pasta is something else. Couldn't believe my eyes when I first saw it! @tigerfish – I think so too! @luvtoeat – It is a rare find indeed! Thanks! @Tizzy – I should have kept one or two of those bowties….they are so pretty. @Cinnamon-Girl – I love the bowties too. Wish they will restock. Thanks….it was fun to think up of how to marry it with other ingredients.